We’d love your help. Let us know what’s wrong with this preview of She by Robert A. Johnson. What does it mean to be a woman? What is the pathway to mature femininity? And what of the masculine components of a woman's personality? Robert A. Johnson explores these questions in this new edition of She, updated to reflect the growth of his thinking on these subjects. Many writers and scholars have long considered that the ancient myth of Amor and Psyche is really the What does it mean to be a woman? What is the pathway to mature femininity? And what of the masculine components of a woman's personality? Robert A. Johnson explores these questions in this new edition of She, updated to reflect the growth of his thinking on these subjects. To ask other readers questions about She, please sign up. A short read assembled by a Jungian psychologist type fellow. Overall pretty flaky and shallow. Idea herein is that the Greco-Roman character Psyche and her associated tale of love w/ Eros is actually a template for feminine behavior and personal evolution. The book reads pretty much like a horoscope and as such is not terribly interesting or full of impact (or win, if you're a hip nerdcore kid). Apparently, this same author has written a similar tome for males based upon Ares. Most likely won't A short read assembled by a Jungian psychologist type fellow. Overall pretty flaky and shallow. Idea herein is that the Greco-Roman character Psyche and her associated tale of love w/ Eros is actually a template for feminine behavior and personal evolution. The book reads pretty much like a horoscope and as such is not terribly interesting or full of impact (or win, if you're a hip nerdcore kid). Apparently, this same author has written a similar tome for males based upon Ares. Most likely won't be visiting that. An interesting essay, but still slightly subjugative. I wonder if it's because of the author's personal views, or a sign of the time in which the book was written. Was 1989 really that long ago? There is a companion book called "He" (of course). از مقدمه ی سخت و غیر جذاب! مترجم و ترجمه ی نه چندان مناسب کتاب که صرف نظر کنیم، خود کتاب یکی از بهترین هاست! کتاب با نگاهی به اسطوره ی سایکی و اروس به روانشناسی و تحلیل زن درون بر اساس رویکردهای یونگ می پردازد. کتاب شامل 9 بخش است. 3 بخش اول کتاب به تحلیل سه شخصیت محوری اسطوره آفرودیت، سایکی و اروس اختصاص دارد. در فصول بعدی دکتر جانسون به روانشناسی مرحله به مرحله ی این اسطوره می پردازد و در فصل 8 با بررسی و تحلیل خوان های پیش روی سایکی کتاب به اوج خود می رسد و نهایتا در فصل 9 تحلیل های مطرح شده به روانشناسی زن مدرن پیوند می خورد. تقریبا همیشه تمایل به احساس خودکشی نشانه ی رسیدن به لبه ی یک آگاهی جدید است، یک سطح آگاهی تمام شده است و سطح دیگر آغاز به رشد می کند. آگر ادمی بر لبه ی این تیغ بتواند آن چیز درست را بکشد- روش های قدیمی، رفتارها و عادت ها را – و به خود آسیبی نرساند، یک دوره ی پرانرژی جدید آغاز خواهد شد. وقتی زن یک تجربه ی کهن الگویی دارد معمولا در مقابل آن فرو می پاشد. در این فروپاشی است که زن به سرعت ارتباط کهن الگویی خویش را پیدا می کند، وجود درونی اش را دوباره بازسازی می کند. زن این کار را مثله مرد انجام نمی دهد. مرد ممکن است بیرون بزند به دنبال کارهای قهرمانانه بگردد. اما زن در این زمان به مکانی ساکت می رود و صامت و ساکن می ماند. تلی از تناقض سوار بر تناقض زن احتمالا در می یابد که مرگ عادت های گذشته را در آغوش کشیده است. "Unless we do conscious work on it, the shadow is almost always projected. That is, it is neatly laid on someone or something else so we do not have to take responsibility for it". I took notice of him passing away last 24th September. My homage, reading him and listening to him. This is a great book as proof that, in some cases, a myth (namely Psyche and Eros) may provide a model for understanding woman’s failed or successful psychological development. But, despite Robert Johnson mentioning the "Unless we do conscious work on it, the shadow is almost always projected. That is, it is neatly laid on someone or something else so we do not have to take responsibility for it". This is a great book as proof that, in some cases, a myth (namely Psyche and Eros) may provide a model for understanding woman’s failed or successful psychological development. But, despite Robert Johnson mentioning the feminists having a lot to say about this mythical approach, he doesn’t reveal much. To me, in our days the Feminist movement, in some cases, reached the incomprehensible level, maybe, demanding new Myths to explain and understand such a feminist fury (and hate projection? ), ultimately, and negatively, impacting on women’s psychological development. And there’s always the question of those true and false feminists. Though not agreeing totally with Ayaan Hirsi Ali, her words may shed some light on these issues: “…the serious and sincere feminists who really care about the equality between men and women…should not be seen with these fake feminists”. Hirsi Ali was commenting on a “Women’s March” back in 2017; and she’s been critical about Islam*. She's quite an antithesis to Linda Sarsour. "Crawl back under your rock"
Well, I still don't understand Feminine Psychology, but I enjoyed reading the book. Another notch in the belt of Jungian thought. One of these days I expect to have an awakening when it will all suddenly make sense to me. Till then I continue to plug away at reading – building a foundation I hope. This one looks at the myth of Eros and Psyche as a metaphor for the spiritual journey every woman faces. A book about feminine psychology written by a man and using a man-centric pscyhological interpretation.An interesting essay, but still slightly subjugative. She: Understanding Feminine Psychology is an interesting book for readers that are intrigued by philosophy, psychology, mythology. Johnson relates feminine psychology to the Greek myth of Eros (Cupid) and Psyche to show the similarities between modern and ancient times, as well as the surprising authenticity and relevance of this myth. The myth deals with Psyche, a young, lonely daughter of a royal family that ends up falling in love with Cupid, the son of the very jealous Aphrodite. She has no She: Understanding Feminine Psychology is an interesting book for readers that are intrigued by philosophy, psychology, mythology. Johnson relates feminine psychology to the Greek myth of Eros (Cupid) and Psyche to show the similarities between modern and ancient times, as well as the surprising authenticity and relevance of this myth. The myth deals with Psyche, a young, lonely daughter of a royal family that ends up falling in love with Cupid, the son of the very jealous Aphrodite. She has no idea that she's in love with Cupid because she was originally arranged by Aphrodite to love and marry Death, but Cupid pricks himself with one of his arrows and falls for Psyche. Long story short, Psyche finds out that she's in love with Cupid and loses him. In order to win him back, she must go through many challenges created by Aphrodite. She makes it through each task with the help of nature and even Cupid. In the end, they get married and Psyche receives immortality from Zeus. Johnson compares this myth to the experiences that women have in their transition from maidenhood to womanhood. He also elaborates on the maturation of women during marriage and the relationship between women and their mother-in-laws. One of the most interestingly analytical aspects of the book is his explanation of a woman's abilities to gain consciousness of the cruelty in the world around her and to encourage and understand herself emotionally and psychologically in times of distress. I found it quite interesting when Johnson admitted that men needed the femininity of a woman in order to fully understand and find meaning in situations and sometimes even in themselves. He elaborates on this topic much further in one of his other books, He: Understanding Masculine Psychology. Many women that have read this book were taken aback and somewhat offended by the fact that the writer was a man, but I actually wasn't surprised or angered by it. I can honestly say that there is a great deal of truth in the book, but it is quite general. I really enjoyed the book because the author kept me on edge. Not because he was always right about everything, but out of my own curiosity to see whether or not he'd say something ridiculously sexist. I have to admit that the book wasn't what I was expecting, and I'm pretty relieved about that. Of course there are a few things that I disagree with, but that's mainly because I can't relate to a lot of the generalizations that were made in the book. I would recommend this book for strongly opinionated people because its great for finding new topics to either support or refute. 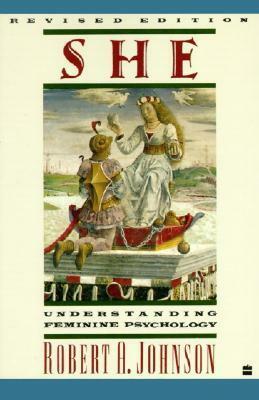 Its also a good book for debates and discussions concerning both the masculine and feminine psyches. I recently discovered this author but I wasn't as impressed with this as I was some of his other titles. It read more like a good college psychology paper. Maybe feminine psychology isn't his strongest point. I wouldn't call it a waste of time, however. Well, I'm not a believer in fate, but this book was what I needed to read at this exact moment in my life. Some of the love stuff was kinda schmaltzy for me, but I really loved the bits about personal development and growth. Oh, and the parts about weddings and marriage? I had to get a pen out to underline at that point- I was like, PREACH, Robert A. Johnson! Some of it made sense, some of it was kind of nonsensical... women should not define themselves and their femininity around men. Also, I would of been more comfortable and the research done was by women.... However, there are some good ideas about men and women needing femininity and masculinity both. There is a lot of good information surrounding evolutionary theory: how did the genders get this way? However, the author defines personality and purpose strictly in gender. As my boyfriend has man Some of it made sense, some of it was kind of nonsensical... women should not define themselves and their femininity around men. Also, I would of been more comfortable and the research done was by women.... However, there are some good ideas about men and women needing femininity and masculinity both. There is a lot of good information surrounding evolutionary theory: how did the genders get this way? However, the author defines personality and purpose strictly in gender. As my boyfriend has many feminine qualities, and I have many masculine qualities, we cannot fit into these strict gender roles. The book is better than then name, well written by someone who helped me see the value of myth in society... he also connects how Western society's passion for falling in love, is the displacement of how we used to have a Love for God... but religion is unpopular and romance movies are popular. He explores our psychology of passion and love in terms of Psyche and Aros (Cupid)... and it's a bit sexist of course... written some years ago, but the philosophy/psychology/myth of this short book, so w The book is better than then name, well written by someone who helped me see the value of myth in society... he also connects how Western society's passion for falling in love, is the displacement of how we used to have a Love for God... but religion is unpopular and romance movies are popular. He explores our psychology of passion and love in terms of Psyche and Aros (Cupid)... and it's a bit sexist of course... written some years ago, but the philosophy/psychology/myth of this short book, so well written and insightful, was worth it for me. Kind of reflects the plot. Johnson uses the myth of Cupid and Psyche to explore feminine psychology - perhaps the first time that anyone had put it into so many words for me that each woman has a masculine side to her soul and each man has a feminine part to his soul. This deepened my connection to Cupid and Psyche which just kept popping up everywhere for me around this time in my life. He, She, and We are three parts of a whole that take you on a journey which navigates the recognition and integration of the male and female psyche in each of us. I was turned on to these by Dr. Gentz who is a practicing psychologist in Tulsa Oklahoma. My partner and I read them at the same time. We found that parts of these books were better absorbed on the second reading. É sem dúvida muito curioso este tipo de livros que acabo de descobrir, através de um mito/ lenda sobre o qual nos é demonstrado aquele que é o ser psíquico da mulher. No entanto consegui aperciar de uma maneira mais vantajosa o 1o volume, He. more like 3.5 stars. It was interesting the interpretation of the Psyche, Eros, Aphrodite myth. I also enjoyed some insights re: the female influence over the male influence. Yet another book from my "Psych of Identity" class. About the feminine archetype in psychology. Just couldn't get into this one. Disappointing after what a revelation We was. Somebody up there is over looking what I am reading. Oh man! It was one of the most Aha reading moment of my year. I have read the prequel to this book, "He: Understanding Masculine Psychology" and greatly enjoyed it. So when I saw this book it was only natural that I pick it up! This book, much like it's prequel, is extremely short and sweet and can easily be read in a day. It's a work of Jungian psychology (my favourite kind!) so it looks at a myth (In this one, the myth of Psyche and Eros) and demonstrates how that myth has profound insight on our internal lives. I felt that the prequel, dealing with men, I have read the prequel to this book, "He: Understanding Masculine Psychology" and greatly enjoyed it. So when I saw this book it was only natural that I pick it up! This book, much like it's prequel, is extremely short and sweet and can easily be read in a day. It's a work of Jungian psychology (my favourite kind!) so it looks at a myth (In this one, the myth of Psyche and Eros) and demonstrates how that myth has profound insight on our internal lives. I felt that the prequel, dealing with men, was very accurate (though it had its problems) and I felt this one also delivered great illumination on our inner lives. It's important to note that in Jungian psychology every man has a little bit of woman in him and vice-versa, so you can enjoy this book and it's prequel regardless of your gender. You will learn about your inner man/woman. Robert's writing is always clear and lucid. It is amazing how much information he can pack into such a short little book. However, I found it weird how this book doesn't have the same format as the prequel. "He: Understanding Masculine Psychology" included a full version of the myth it was basing itself on, and mentioned which version of the myth it was using, but this one doesn't. It would have been good if it did because I have seen many versions of the Eros and Psyche story and would have liked to know which version of the story was being used. Female mythology as an element of our lives is found in men and women. "Myths are rich sources of psychological insight. Great literature, like all great art, records and portrays the human condition with indelible accuracy." "It is almost always women who say, 'Let's sit down and talk about where we are.' The women are almost always the carrier of growth in most re Female mythology as an element of our lives is found in men and women. "Myths are rich sources of psychological insight. Great literature, like all great art, records and portrays the human condition with indelible accuracy." "Todos los hombres son iguales", una frase que poco ayuda a comprender la complejidad del hombre interior de las mujeres. Robert A. Johnson aborda el tema del Animus, la energía masculina dentro de cada mujer, a partir del mito de Psique y Eros. La jornada de la mujer en su paso desde la doncella hasta la diosa consciente de su fuerza interior. 3. Cargar una copa del agua "Todos los hombres son iguales", una frase que poco ayuda a comprender la complejidad del hombre interior de las mujeres. Cada tarea provoca en la doncella el desmayo ante el estrés de sentirse incapaz de enfrentar su tarea y finalmente es rescatada del sueño de muerte por parte de Eros, que representa la posibilidad de integrar su Ánimus y convertirse en una mujer plena. 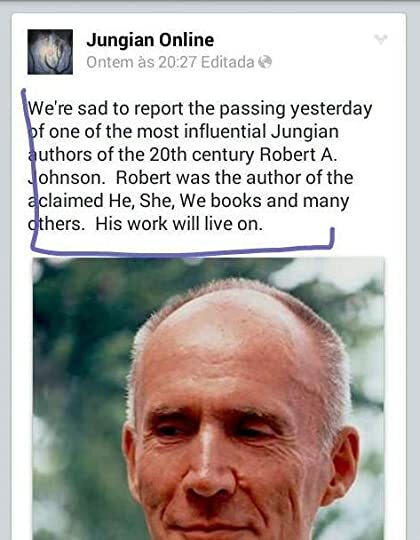 Robert A. Johnson is a noted lecturer and Jungian analyst in private practice in San Diego, California. He has studied at the Jung Institute in Switzerland and at the Sri Aurobindo Ashram in India.